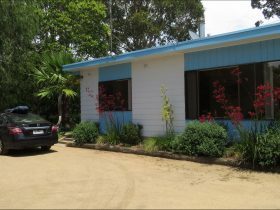 BIG4 Tathra Beach Holiday Park is located directly opposite Tathra’s surfing beach and a short stroll from shops cafes and clubs. The park offers accommodation from powered caravan and tent sites, en suite cabins to luxury spa villas. All accommodation is air-conditioned for year round comfort. 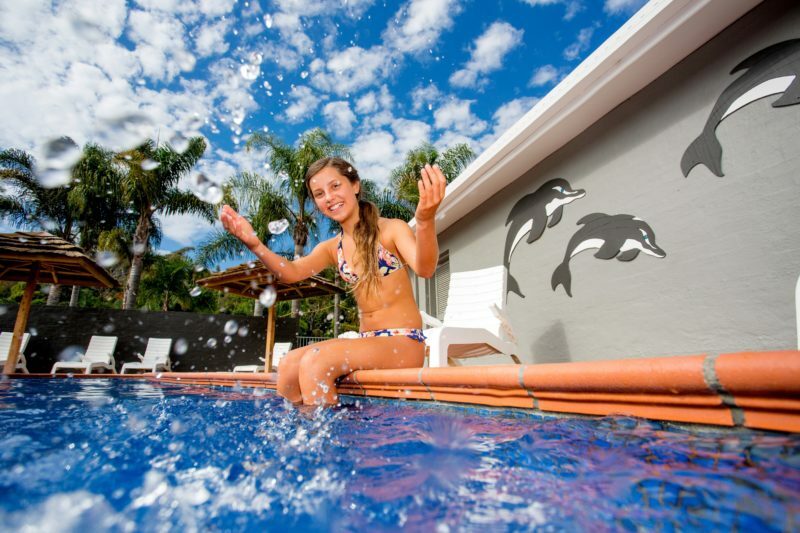 Facilities include a resort swimming pool, playground, games room, campers kitchen and barbecues, making it a perfect destination for a family holiday. 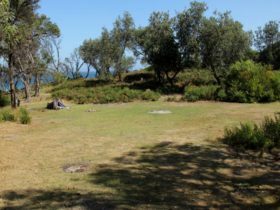 Tathra is located on the coast in the middle of the Bega Valley Shire. 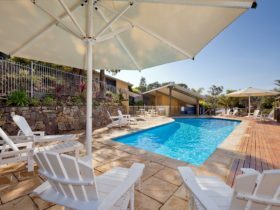 The perfect place to base yourself beachside to relax, or use as a gateway to explore the attractions of the Bega Valley. Polynesian style cabin that will accommodate a family of four. This two bedroom cabin has double bed all made up including two bath towels, and second bedroom with two single beds made up including bath towels. Bathroom has shower, toilet and vanity. Kitchen is well equipped for self catering including an upright stove, refrigerator, microwave, utensils, pots, pans cutlery and crockery. Dining/living area furnished with three seater lounge and arm chair, dining table for four ,coffee table and colour television. Cabin has veranda at front with outdoor setting. Two bedroom luxury spa villa that will accommodate a family of six. Main bedroom has queen bed all made up and bath towels supplied. Second bedroom has two single beds made up including bath towels, and two over head bunks attached to the wall that lock into position when required. Linen and bath towels are provided for the bunks. Bathroom has spa bath, separate shower, washer, dryer and vanity. Spacious well equipped kitchen with under bench oven and ceramic cooktop, refrigerator, dishwasher, microwave, pots, pans, utensils, cutlery and crockery for self catering. Dining area for six and lounge room furnished with three seater lounge and arm chair, coffee table, colour television and DVD. Veranda with outdoor setting out front. Park Cabin basic range providing accommodation for a family of five. Main beds are made up and bath towels supplied. Bring your own linen, blankets and bath towels for bunks. En suite bathroom with shower, toilet and vanity. 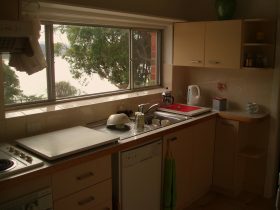 Full kitchen for self catering, well equipped with pots, pans, utensils, cutlery and crockery. Furnished with two seater lounge, dining table for five and colour television. Veranda at front of cabin with outdoor setting. 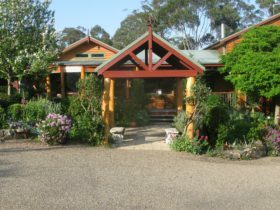 Park Cabin for self-catering accommodation for a family of five with two dedicated bed rooms, consisting of a queen bed in main and triple bunks in second bedroom. Main bed is made up but you must bring your own linen, blankets and bath towels for the bunks. Fully equipped kitchen with gas stove, refrigerator, microwave, pots, pans, utensils cutlery and crockery. Dining/living area has two seater lounge, dining table for five and colour television. Cabin has full length veranda with outdoor setting. Polynesian style two bedroom cabin that will accommodate a family of six. Main bedroom has a double bed all made up and including two bath towels, the second bedroom has four bunks. Bring your own linen, blankets and bath towels for bunks. Fully equipped kitchen with electric upright stove, refrigerator, microwave, pots, pans, utensils, cutlery and crockery for self catering. Living/dining area furnished with three seater lounge and dining table for six. Cabin has veranda at front with outdoor setting. 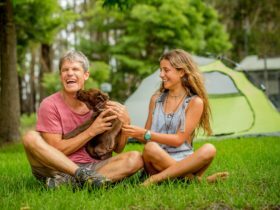 Powered sites suitable for tents, caravans and motorhomes. Individual sullage and water. Each site has a connection point to the park television system providing free to air, pay television and in house movies (hire cable required). Powered site with private en suite at rear of site. Individual sullage and water. Park television connection available (cable hire required). Accommodation price range from powered sites to luxury spa villas.